Twitter has a good Help Centre that covers the basics, however let me run through a few for you. When accounts you follow tweet, their tweet will appear in your timeline, or stream, in real time. You can reply to tweets. Just to be clear, you are responding to the person who wrote the tweet directly, and publicly. If you saw the movie “Chef” you will understand why I am making this clear! Click on the “reply”button in the tweet you want to respond to. By starting a tweet with @acctnamehere your tweet will only be seen by the person you are tweeting and anyone else that follows both you and that account. If you want all your followers to see it prefix the tweet with a . like this . @paolabrett and it will appear in your followers’ stream. 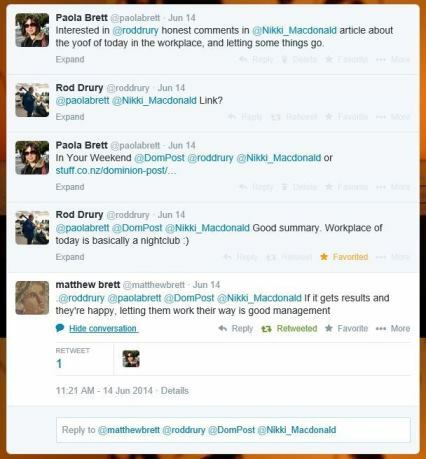 Below is an example of an interaction using mentions (in my first tweet), then Rod Drury replies to me. I reply so my followers will maybe see that tweet, then I get a direct reply again from Rod Drury and finally @matthewbrett uses the . to keep the tweet visible to all while replying. You can retweet a tweet, effectively you reshare someone’s tweet to your stream. Twitter provide a retweet button in tweets, when you use this a green box will appear above the tweet and say it was retweeted by you. In the web version you are limited to just straight forward retweets, however in Twitter apps it’s possible to quote a tweet and add some comment of your own, if there are enough available characters. Select ‘quote tweet’ in the app, then make your comment and the letters ‘‘RT’ (retweet) before the actual tweet so it differentiates between your thoughts and those in the retweeted tweet. I view this as very important, as you attribute content to the appropriate person. You can also modify tweets, where you quote only part of someone’s tweet, removing some of their content to make room for your own. You would put your comment first, then prefix the tweet you are quoting with MT (modified tweet) just before the tweeter’s handle so followers understand it’s modified and they are not seeing the full, original content. You can mention someone in a Tweet by using @personstwitterhandle and this means they are notified they were mentioned in the tweet. So, if you are talking about a person or business, you can ensure they see the tweet by using their twitter handle and ‘mentioning’ them. If you follow someone and they follow you, it is possible to send Direct Messages to each other, and these messages ARE just between the two of you, and not a broadcast. Sometimes it’s a struggle to fit it all into a single 140 character tweet, so you can cheat a little by spreading your thoughts across, I’d suggest no more than, two tweets. As you prepare your second tweet prefix it with trpt – this refers to previous tweet. It used to be This tweet refers to previous tweet, but it was shortened. Ah, hashtags. This could probably be a blog post of its own! A subject that seems to get Twitter newcomer’s knickers in a twist! It is something that irritates the heck out of me, as some tweeps do it sooo badly, and yet it’s really not that complicated! The use of hashtags is so badly demonstrated by Twitter users at times that it perpetuates the folly of it’s use! Ok, pay attention to the next bit, please! I think that is pretty straightforward – consider a # as a search tool. It puts your tweet into context, associating your tweet with a specific topic. Not all tweets need to contain a hashtag. Really, they don’t! If you attend an event it’s likely they may have an already prepared # – recently The Kiwi attended a conference and they used #WDCNZ – Web Developers Conference NZ. I attended the #HootupWLG last month and it became a trending topic as tweets were tagged with this hashtag. The Fifa Football World Cup trended considerably, particularly during certain matches, due to the hashtags used. 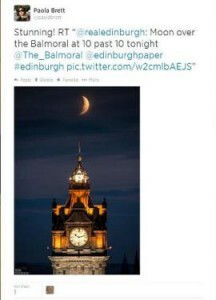 As it happens, this article was posted today – Twitter’s hashtag guide for dummies if you want to have a read! So, I think that’s about covers the practical stuff. It is social, so finding your feet and joining into that first conversation can be daunting – it’s like butting into a conversation you have overheard. Keep in mind, that just as there are ways of doing that face to face, there are ways to do that online. I think my first interaction was a conversation by two Kiwi’s living in London, discussing where to find a decent coffee – I tweeted them and made a suggestion and a lovely conversation developed, and one of those Tweeties is now a good friend! It is a social media, but remember there is still etiquette involved, always think what would you do in person? How would you like others to treat you? Right. Learn as you go. Give it a try, go forth and tweet! Have fun. Tagged with hashtags, how to use hashtags, modified tweets, retweets, Social Media, twitter, Twitter 101, Twitter guide.